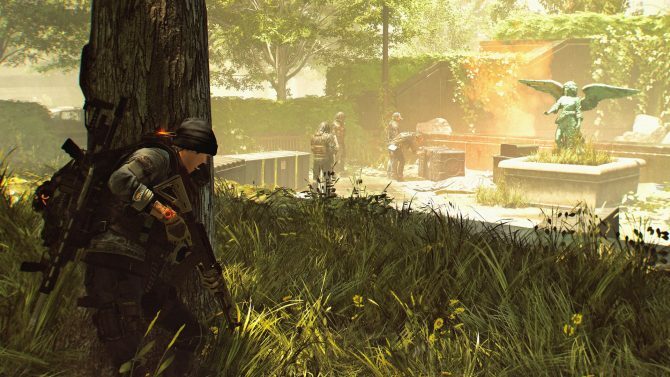 Tom Clancy’s The Division 2 is created specifically to appease fans of the first and maybe even some critics. That statement is probably the least surprising to anybody with a handle on how sequels to major AAA games work, but it was my main thought upon walking away from the demo. Most everything you know from the first game is back, from UI, controls, and RPG mechanics of the ever-satisfying numbers go up genre. Replacing the post office base of operations from the first game is a much more iconic American location: The White House. Rioting civilians in hoodies, Rikers inmates awaiting bail, and blue-collar sanitation workers are out. Hyenas (aggressive and ruthless people taking advantage of the dystopia to steal from and abuse others), Outcasts, and True Sons are the new enemy factions, whose names make me think they are ex-military and militia respectively. Instead of shooting hundreds of people to take back New York City you will be helping settlements by shooting hundreds of people to save Washington D.C.
Thematically this is a Tom Clancy game through and through, from the special operations dress up with speculative military technology in use to the hoo-rah of taking back D.C. and restoring order, the status quo, and a period in the past that was better than the ever-present now. 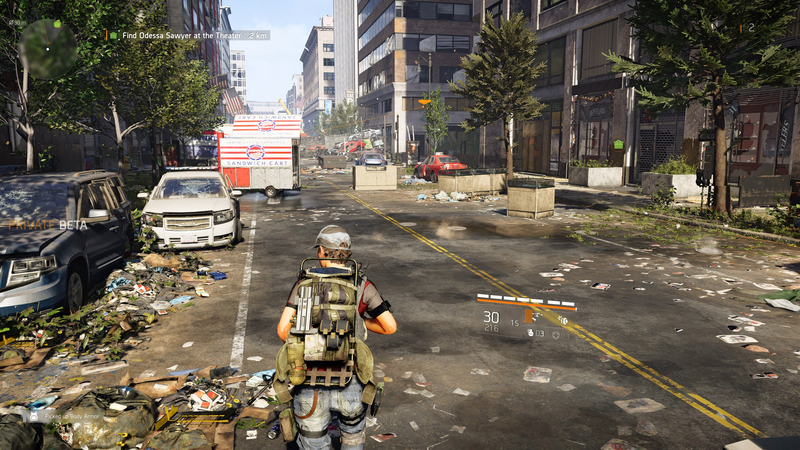 And yet, despite knowing full well the loot-driven, XP accrual gameplay of these games is not something that hooks me for very long, I find myself drawn to The Division 2 in all its Americana glory. 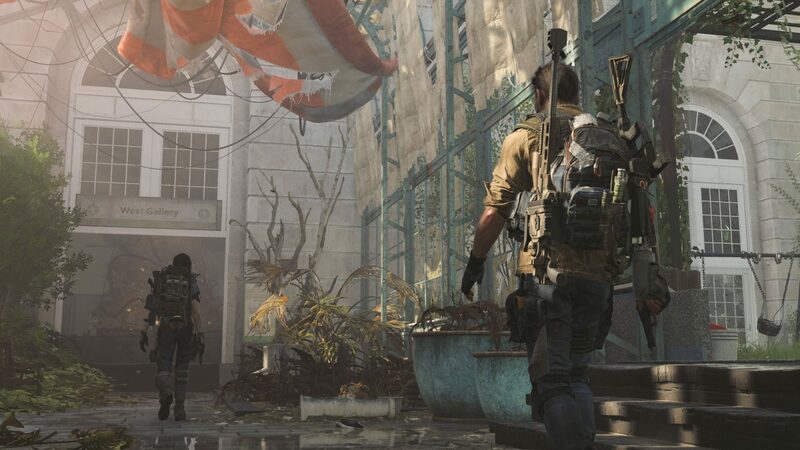 Whether it’s because of growing up on Nerf guns and Transformers movies or just a preference for recognizable locations over fantastical sci-fi, The Division 2 remains the live game most appealing to me. Aspects of the open world have been tweaked, seemingly in response to some peripheral criticisms of the first game. Nondescript enemy factions who were built of civilians, prisoners, and “insane” workers of the first game weren’t exactly compelling people to riddle with bullets like the game asked, because they are all just people. This time around enemy factions are much more aggressive and threatening, specifically to civilian settlements that you take missions from. 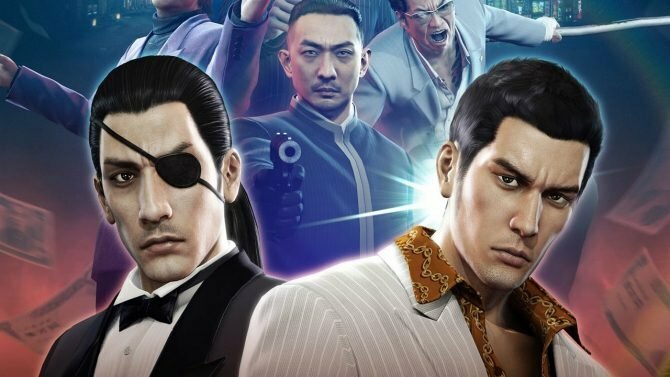 Instead of roaming the city happening upon missions where you shoot lots of people in order to help the city in an ambiguous, detached way, you are doing the same shooting but now for a clearer, more tangible reason. The one settlement mission we undertook during the preview event was for Odessa Sawyer and the mission was to save her daughter from a group of Hyenas. 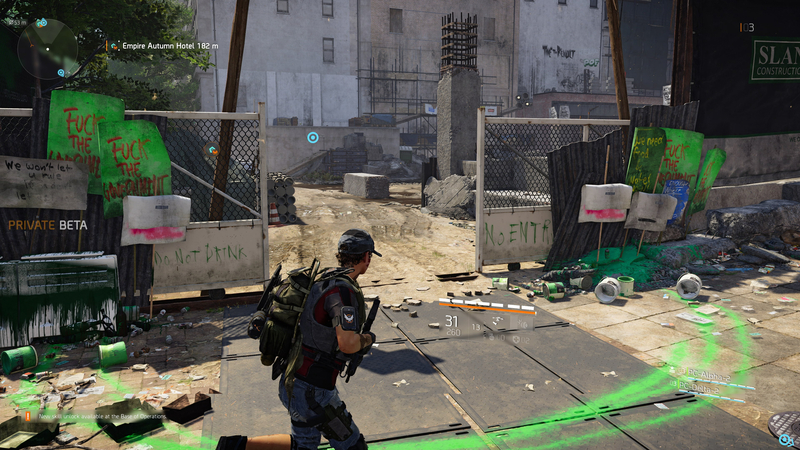 This mission was compared to the action movie The Raid, which is a tough statement to follow up in actual gameplay seeing as The Division 2 is about shooting enemies until their health bar drops to zero and not a thrilling martial arts movie. Instead, the main relation was that the setting was a hotel and we, the Division agents, made our way to the top, taking out the Hyena leader and saving Odessa’s daughter. 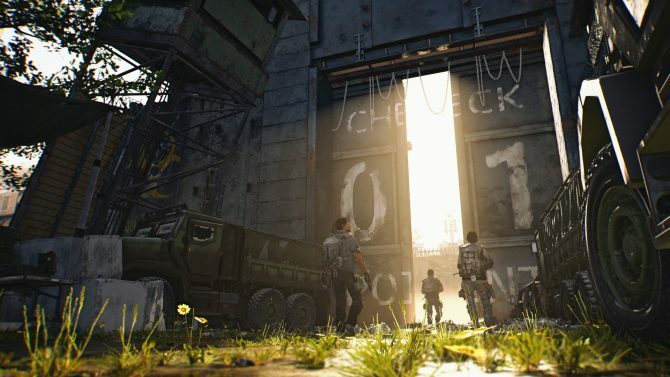 Odessa is an example of a micro story told within The Division 2, whose campaign is expected to take up about 14 hours. Micro stories are set to revolve around named characters who are trying to survive in D.C., while the macro story is the big picture “Take back the Capital.” Both instances require running place to place, killing enemies, earning and crafting better equipment and weapons. 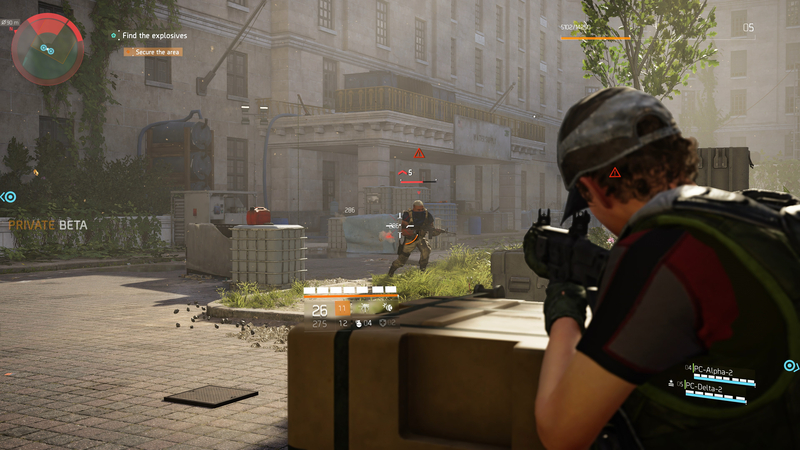 Those who fear a repeat of endgame content, or lack thereof, have nothing to fear, as every update that came to The Division, from 1.0-1.8, will be included in The Division 2 at launch along with its own additions to the field, such as specializations. These are endgame content branches that come with their own unique weapons. 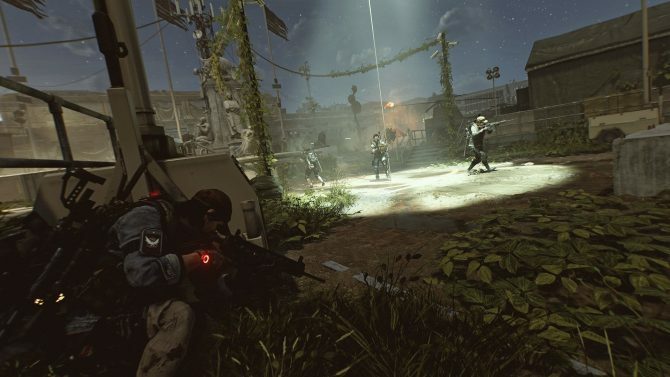 Endgame content in The Division 2 also has its own story justification, as a new faction, the Black Tusks, invade D.C. and occupy the Capitol Building, as well as other areas on the map. This faction is highly advanced complete with their own drones, robotic rovers, and other designs straight from Boston Dynamics but sporting military hardware. It can be a bit disorienting when you see a four-legged drone with a massive turret on its back run towards you, although during the demo their annihilation was followed by a flashing in and out of existence visual error that offset the previous terror. Much of the gameplay will be repeatedly taking cover, flanking, throwing grenades, shooting using whatever weapon you gravitate most towards (for myself it was a double-barreled shotgun), and utilizing some Division gear such as a rolling explosive ball, hovering drone, and turret that were accessible for our demo. The rolling explosive was my favorite, as sitting behind cover, calmly setting it down, and picking an enemy for it to pathfind its way towards to deliver death was pretty much always satisfying. The drone took some getting used to, as the version I chose would deliver an AOE explosive attack that required you to set an area for twice. The issue with this is that most of the time you are going to be using it to try and take out enemies behind cover which can be complicated by differences in elevation, as your perspective when aiming the drone’s attack area makes it difficult to determine the best marker. The third option, a stationary turret, came in the machine gun or sniper variety, with the sniper allowing you to pick what targets it would shoot at. While the guns, in general, lacked the haptic feedback and weight of say Destiny or Anthem, the recoil was enough to emulate their power. A mechanic touched on but remains speculative at best is that enemy strongholds will be competing with settlements for resources in the open world. This means the roving enemy groups you may encounter while traversing from mission to mission on the map are presumably hunting for or returning resources to their strongholds to make them stronger and more difficult to overcome and reduce the resources capable of supplying allied civilian settlements. Whether this will have a tangible effect on the status of your settlements or the difficulty of enemy strongholds remains to be seen, as it requires much more time investment than was afforded by our demo. Washington D.C. will have plenty of things to do for those willing to spend hours clearing out the map, from main and side missions, safehouses (which act as respawn points), control points (tougher enemy gatherings that are entrenched in a specific area), settlements (essentially additional bases with their own vendors and missions), three Dark Zones (including a unrestricted Occupied Dark Zone), and strongholds (not seen in the demo). Endgame content has its own host of missions and eight-player raids, with all future DLC being free to download in order to keep the player base un-split. Three episodic expansions are promised, adding to the PvE content. Washington D.C. itself looks great, repeating the messy, dystopic vision of New York City from the first game. While that took place in the wintertime, D.C. is in the midst of a humid summer in The Division 2, and its temperature is adequately felt through the presentation of sunlight, greenery expanding beyond its initial barriers, and muck. 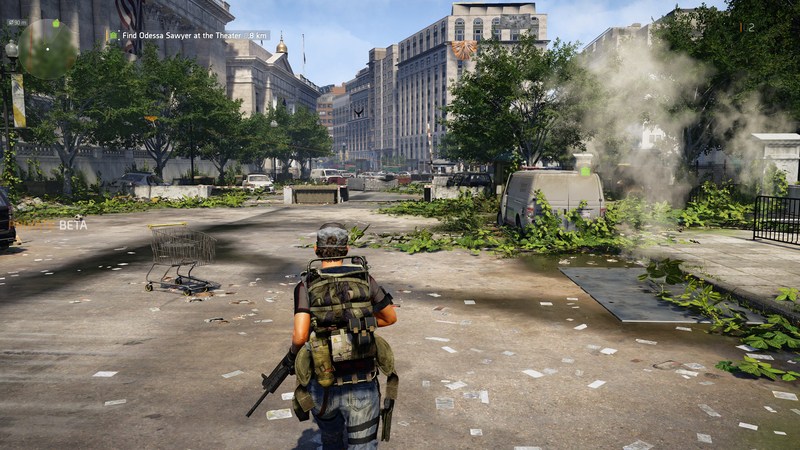 The Division 2 is a safe bet in terms of whether or not its something you’ll be interested in. The live game aspect has the backing of Ubisoft, whose devotion to its other live games such as Rainbow Six Siege, For Honor, and the first Division game all prove it has the will and capability of keeping its players active and happy months after release. Despite the back-and-forth “politics” conversation surrounding the game’s promotion, all you need is to recognize the Tom Clancy branding. That means no matter the subject, the overall movement will be towards a vague idea of American values, Democracy, and gung-ho militarism. There is no room for forward change, only salvation and restoration from the precipice that threatens to plunge American civilization into destruction, whether from within or from without. Creative director Terry Spier of The Division 2 studio Red Storm talks to DualShockers about fan feedback, Washington D.C., and Tom Clancy himself.